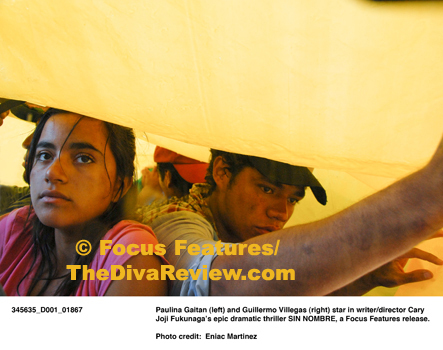 Sin Nombre is the first feature by director Cary Joji Fukunaga, a young Californian who became fascinated by the subject of the trials of Latin American immigrants whilst making a short film called Victoria Para Chino. Fukunaga enlarged on that concept, combining Victoria’s central theme of the hardships of Latino immigrants with a story about the chilling realities of life as a young man in a Mexican gang, resulting in a picture that’s as beautiful as it is brutal. In his small town in Tapachula, Mexico, Willy has an admirer. A 12-year old boy follows in the footsteps of the older teen, emulating everything he does, including joining the resident gang, the Mara Salvatrucha, and after a hard fought and bloody initiation, the 12-year old boy is renamed Smiley. A law unto themselves, the gang rules their small corner of the world with no fear of the police and a flexible code of honour that doesn’t hesitate at dispensing cruel punishment to rival gang members. Neither does it shrink at exacting revenge on one of their own after an incident between Willy and the gang’s nightmarishly frightening leader, Lil Mago. Immediately after carelessly destroying the one thing Willy cares about, Lil Mago - in a tragically short-sighted choice of wingmen - orders Smiley and Willy to accompany him to rob a trainload of desperate émigrés. One of those being rolled by Lil Mago and his homies is Sayra, a young Honduran teenager, whose long lost father has turned up with a scheme to sneak back into America, giving his daughter the better life he enjoyed with a new family before he was deported. Apparently, prospects in Honduras are so dim that he will risk both their lives squatting in train yards, dodging the border patrol and brutal muggings, while balancing on top of a train for days in torrential downpours to make it across the U.S. border. At the very moment it looks as if the poor family is going to lose everything, they are rescued by a most unlikely hero after Willy makes a desperate and irrevocable choice. Willy’s actions make him an outlaw to his gang and he is utterly friendless except for the tentative hand offered by the girl he saved. Like pulling a thorn from the paw of a lion, Sayra approaches the hunted, wounded boy, believing in her new champion while everyone else avoids him as a murderous thug. Sayra even abandons her own flight to help Willy survive the gauntlet of gangland the train crosses through. Both teens have given up their respective families on this quest that’s turned out the way neither could have expected and each needs the other to find a new future and leave their old lives and regrets behind. Raw and naturalistic performances are the hallmark of this wonderful film. Edgar Flores as Willy smoulders with the same laid-back anti-hero intensity of 1960’s Steve McQueen. Flores’ dialog-light performance is written through eyes that have seen way too much pain for such a young man. While Willy is a character that shouldn’t be romanticised, Flores makes us understand why Sayra falls for her one-time assailant like a ton of bricks. Paulina Gaitan’s portrayal of Sayra is also achieved beautifully with little verbiage. Gaitan’s hesitant glances and awkward postures capture the girl whose world is turned upside down by a father she never knew and a future she’s ambivalent about until she meets Willy, who at once becomes the irresistible teenage lure of bad boy, idol, saviour and victim. Seen by Fukunaga as his version of a Western, beautiful John Ford-inspired landscapes of lush forests and regal mountainsides mark the train’s progress through Mexico in stunning counterpoint to Willy’s gory existence as a gang member or Sayra’s tin shack poverty. The unexpectedly lovely scenery makes the violence of the gangs who live in these surroundings and the daily terrors faced by the vulnerable immigrants even more incomprehensible. Fukunaga doesn’t glamourise the Mexican gangs; we’re shown the depths of ugliness and brutality that these young men will sink to defending an allotted number of streets from other gang members while preying on innocent civilians and turning on each other at the first whiff of insurrection. The real horror is that for the very young children around the gangs, the members are looked to as beacons of strength and protection. Even baby-faced Smiley is perceived with a chilling awe once his playground friends catch sight of the new gun he’s given to murder his former idol. There is a hopelessness permeating Sin Nombre, which is the enemy of any good intention; love must be hidden, freedom comes with deadly costs and the murder of friends and loved ones is treated as just another day in the gang. It’s that dire existence that makes the possibility that Willy the thug could leave the wreck of his past behind and dream of a future for the first time through Sayra’s belief in him so compelling. 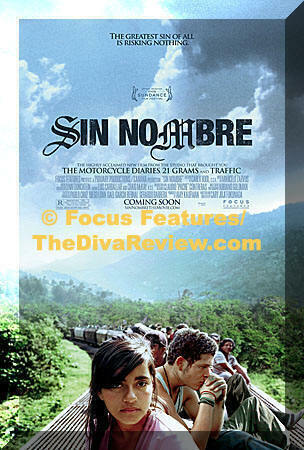 Sin Nombre isn’t easy to watch, it’s as raw as a punch to the gut and just as brutal, but it is also a truly beautiful film, full of wonderful performances and brilliant, articulate direction. It’s a stunning first-time feature and an amazing film that shouldn’t be missed.